Evolving the concept of the DevOps approach at the Jelastic Platform, this time we are pleased to present you with the third guide from this devoted series. The new solution, described in today’s article, gives even greater automation through not just ensuring the project lifecycle management, but also simplifying the process of Jenkins continuous integration server configuration, required for that. This is achieved through combining two progressive technologies: Jelastic pluggable add-ons and Cloud Scripting operations – the next generation solution for application and server management within the Cloud, which is currently being intensely developed by the Jelastic team. 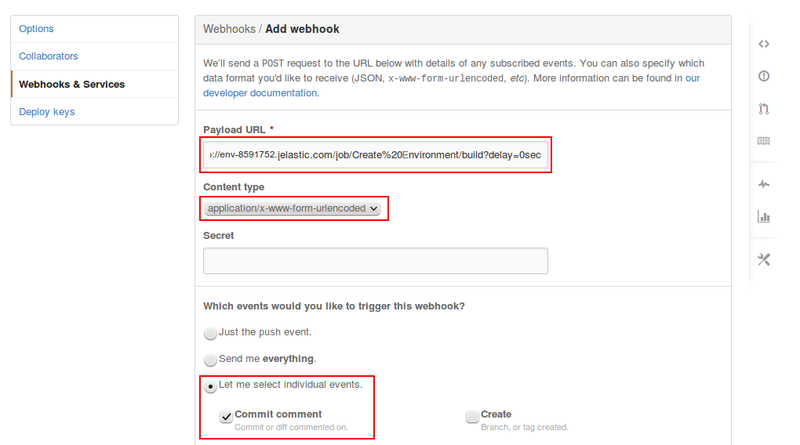 In particular, such an integration allows to automatically create the complete list of job templates, which just need to be slightly tuned (with operations like setting a URL to the repository with the required project, instead of the default one) to complete the Jenkins server adjustment. The true efficiency of such an implementation is maximally revealed in the case of handling multiple projects, as instead of the countless step-by-step manual configurations, required for each of the Jenkins servers to be properly set, you’ll need to create a single add-on just once. Subsequently, it can be easily applied to the required environment in a few clicks with only a few user-dependent parameters required to be adjusted. Such an approach saves an increasing amount time on each following installation. since the core of the continuous application delivery approach we are referring to is represented with the Jenkins server, you need to have an environment with the appropriate software running. As you can remember from our previous guides within the series, getting it becomes fairly easy with the embedded Jelastic Marketplace, which can be accessed either via the appropriate site page or directly through the dashboard. We’ve considered these steps in details previously, thus we are sure you won’t meet any troubles here. As it was already mentioned within this guide’s introduction, the greatest part of the work at the stage of Jenkins server’s setting up is going to be automated. To gain this, the appropriate configurations should be implemented within the code firstly, which will be subsequently executed at your application server with Jenkins handling. 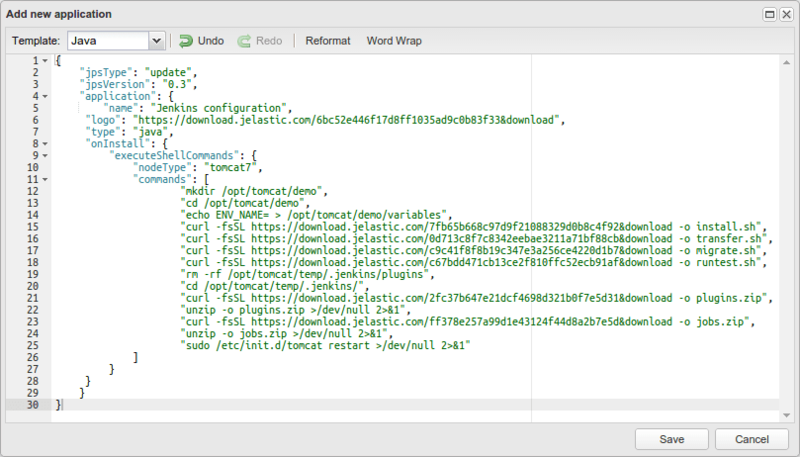 At Jelastic, this could be done through preparing a special JSON manifest file, which, being integrated to the platform, will represent a pluggable add-on, that can be easily run by any user directly through the dashboard. Log into your JCA panel as an administrator user and navigate to the Marketplace section using the main menu to the left. Once inside, expand the Add list at the top pane and select the Add-on option. Whilst the first two settings are obvious, the last one needs to be considered in more detail, thus the next section of the guide is devoted to the specifics of the required operations’ scripting. Further, we’ll examine each of these points in more detail and prepare the core of our manifest according to this flow. Note: Below we provide you with the example code, which needs to be modified according to the specifics of your application. In order to ensure this was done correctly and all of the actions were scripted properly, we recommend a preliminary test of your code. This could be done through creating a separate environment with the same topology your add-on is being created for (i.e. Tomcat 7 with Jenkins app deployed in our case) and running the adjusted commands directly inside your compute node’s container using SSH. If you need any assistance with this, please refer to the complete guidance on the DevOps Add-on for Jenkins Troubleshooting, which additionally includes descriptions of the expected results for each of the presented operations. So, let’s reveal how the above suggested processes can be easily accomplished, with the help of the appropriate Cloud Scripting options. Subsequently, all of them need to be inserted instead of the custom_code parameter in the manifest example, in the same order they are described below. In addition, the 3rd string defines creation of the variables file alongside the uploaded scripts, intended to be used for further storing the automatically generated name for the environments with your app’s different versions. After that, you need to move to the main .jenkins directory and add the necessary plugins and configuration files to the Jenkins integrator instead of the deleted ones by uploading and extracting the appropriate plugins.zip archive. We recommend to use the package we’ve prepared for this example, which already contains all the necessary modules. However, you can complement it with other plugins if necessary or just pack your own zip archive – in this case, note that there are several obligatory tools it should comprise (namely: SCM API Plugin, GIT plugin, GIT client plugin, Environment File Plugin) and all of them should be put in the plugins folder inside the archive. The next section of code uploads and extracts another required package (jobs.zip), that will set Jenkins jobs according to the data inside. Everything else may remain as is, however, you can also edit it or add your own jobs if needed. 5. Finally, define the restart of the server in order to apply all of the executed configs. Being combined together, all these code parts will automatically perform almost all the required Jenkins configurations. Click Save to finish and append your add-on to the list of the already available installations. Finally, to make our module accessible via the dashboard, find and select it within the list, click on the Publish button above and confirm this action at the shown pop-up. Everything is prepared now, so let’s just see how quick and simple the implementation of our DevOps approach becomes now. 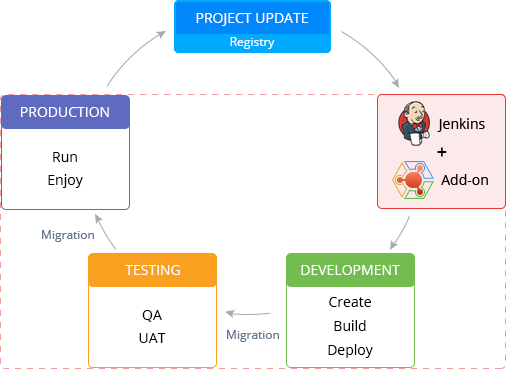 Navigate to the Jelastic dashboard (for the account your Jenkins environment is running at) and perform the following to plug your add-on to the appropriate application server. Hover over the Tomcat 7 node and click the appeared Add-ons icon to display the same-named tab with the list of suitable pluggable modules. Locate your add-on (named Jenkins configuration in our case) and Install it with the appropriate button. Wait for the process to be successfully completed and access the Jenkins dashboard (i.e. Open your environment in browser). As you can see, we’ve got the list of already prepared jobs. That’s all! Now you have a fully configured and ready-to-work integration complex, that waits only for the project change to be committed in order to automatically create an environment, deploy a new application version and move it through the set of required testing and relocation steps. After that, your checked application will appear at production. 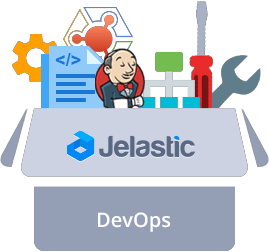 And having the Jelastic attachable add-on for Jenkins configuration already prepared, you can quickly apply this approach to any of your projects through deploying a new continuous delivery mechanism within a few clicks and with slight adjustments done. If you’d like to test this approach live, don’t hesitate to contact us for a free demo cloud evaluation and try it yourself or start with a two week trial at one of the dozens of Jelastic installations worldwide. In addition, you could share your experience on the project lifecycle automation or request for a new tutorial you are interesting in, within the comments below.